I don’t know who was more excited to open up the box containing the Recon 6.0 Programmable Rover….my husband or my children. They were all literally jumping up and down with joy over this cool tech toy from SmartLab® Toys and I have to admit it is cute and really neat! The award winning Recon 6.0 Programmable Rover is a robotic toy that can be programmed to navigate a designated course and it can even speak a command or request. My six year old son is learning how to measure in our home school so I really appreciate that this toy is also educational. He actually has to program in the specified measurements (with a little help from mom and dad) of his desired course directly into the rover and then once it is set….watch it go! 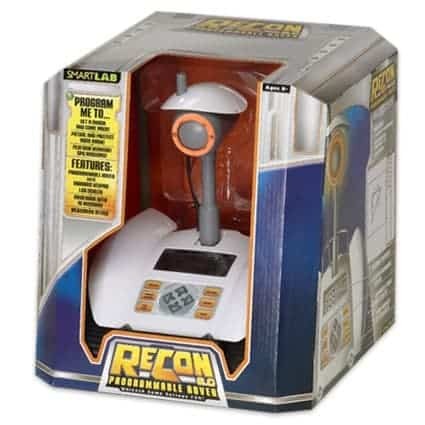 If your child (or spouse) loves tech gadgets and toys then you are definitely going to want to check out the ReCon 6.0 Programmable Rover by visiting the SmartLab® Toys website. You can also purchase this robot for only $69.99 from SmartLab® Toys which a great value for such a creative, fun learning toy. You can check it out in action for yourself too. Now, if you will please excuse me…..I have just been informed that “Robe” our ReCon 6.0 Programmable Robot is about to perform a dance for me in the living room! One lucky reader will receive a ReCon 6.0 Programmable Rover from SmartLab Toys! I would like to give the All-Natural Spa Lab to my daughter. I would love to give the Inside Out! The Human Body. I like the Extreme Secret Formula Lab. Thanks for the giveaway…we like “The Amazing Squishy Brain”. Cupcake Decorating Studio is pretty cool! The Cupcake Decorating Studio looks very nice!